Assoc. Prof. Robert Ackland is based in the School of Sociology at the Australian National University (ANU). He was awarded his PhD in economics from the ANU in 2001. He has been researching online social and organisational networks since 2002, and has been been a chief investigator on five Australian Research Council grants. 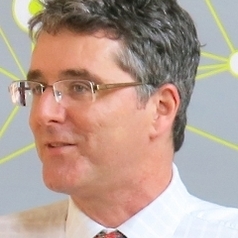 Robert leads the Virtual Observatory for the Study of Online Networks Lab (http://vosonlab.net) which was established in 2005 and is advancing the social science of the Internet by conducting research, developing research tools, and providing research training. Robert teaches undergraduate and masters courses on the social science of the Internet and online research methods, and his book Web Social Science: Concepts, Data and Tools for Social Scientists in the Digital Age (SAGE) was published in 2013. He is a contributor to the SocialMediaLab R package and he created the VOSON software for hyperlink network construction and analysis. VOSON has been publicly available since 2006 and has been used by over 2500 researchers worldwide, and is now developed and hosted by the company he founded, Uberlink Corp (http://www.uberlink.com).